If you would like to learn more about our wild birds, their complexion, behaviour, sounds and about birding, to watch and identify wild birds – then sign up to one of my birding workshops or join one of my guided bird walks. For dates see below. To avoid disappointment because of fully booked workshops keep yourself up to date with the Let’s bird-Newsletter. You will get informed as soon as new dates for workshops or bird walks are to be announced. To take part you should enjoy being in nature and like to exchange knowledge in a group of like-minded people. 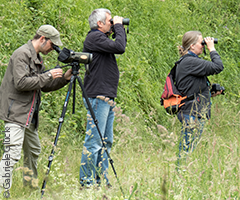 The birding workshops* are mainly designed for beginners and restarters. You will learn about the characteristics and behaviour of our most common wild birds and how to watch and identify them. Depending on the subject and level of the birding workshop we will also talk about binoculars and field guides, close to nature balcony and garden structuring, feeding wild birds, anatomy, moulting and so on. 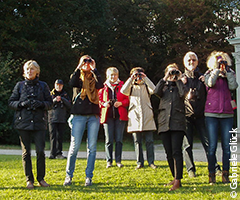 The birding workshops are held in cooperation with the Landesbund für Vogelschutz Munich. They include a theoretical morning class at the LBV main office (Klenzestr. 37) followed by an afternoon excursion in an easily reachable urban area (park, cemetery). 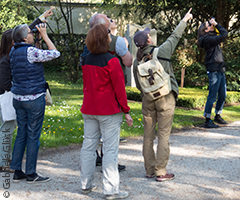 The excursion will take place as described below (“Guided bird tours”) and offers the participants the possibility to use their newly acquired knowledge and consolidate it. The number of participants for the workshops is limited. For the workshops see below. The Let’s bird-Newsletter keeps you informed about new workshops and bird walks. There is no previous knowledge presumed for the beginners workshops (Level 1). For the advanced workshops (Level 2) it is useful but not mandatory to have participated in the corresponding beginners workshop. But learning will probably be more effective when you already feel save with the bird species that were subject of the corresponding beginners workshop. Public guided bird walks* are open to everyone. They take approx. 2 hours and take place in selected parks or cemeteries in Munich. Meeting points for the walks are easy to reach by bike, public transport or car. The chosen tracks are even and easy to walk, the walking speed is unharried. Toilets can mostly be found at the starting point or along the way. The guided tours will take place in all weather. To bring along besides interest: clothing, shoes and headgear according to the weather and if available binoculars. As needed: sun blocker, insect repellent, umbrella, small lunch, something to drink. 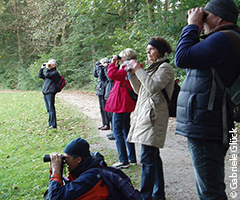 Private guided tours for single persons, pairs or groups, in English or to an individually chosen birding site can be arranged according to prior agreement. Extraordinary present: Let’s bird workshops and guided tours are very well suited as birthday or wedding present for friends and relatives. Bird walks take place throughout the whole year Short-term notice via Newsletter Variable, duration appr. 2 hours Munich € 10.- (kids under 14 y. € 5.-) Not necessary We will watch birds, marvel at their appearance and behaviour and listen to their voices. summerbirds - without permanent species. summerbirds by their song - without permanent species. * Private guided bird tours will be held at the participant’s own risk. 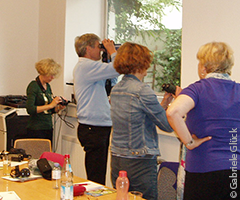 During workshops and guided tours in cooperation with the LBV Munich you are insured.